Kikuyu originated in the East African highlands and was introduced to Australia by seed in 1919 and has since been propagated vegetatively for more than 50 years. Kikuyu is a vigorous light green creeping perennial with above and below ground runners. Kikuyu does not particularly like saline soils, but grows well on any well-drained fertile soil. It has a wide adaptability but does prefer moist, medium textured soils. Kikuyu is usually intolerant of shade. 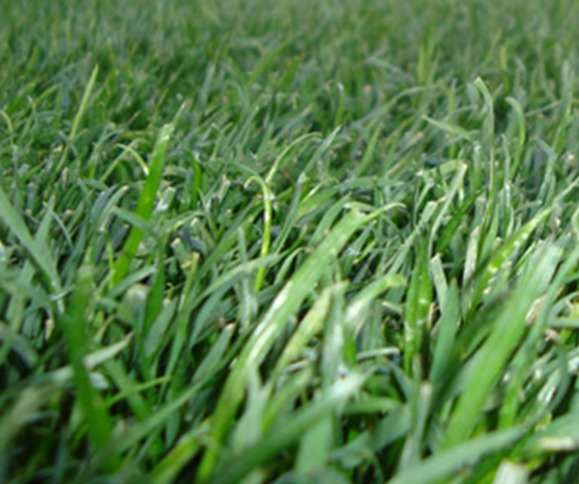 Kikuyu makes an especially good lawn on large areas and is one of the most economical turfs. Kikuyu has been used extensively over the past 30 years for a number of applications. These applications have included as a residential or commercial lawn, in land reclamation projects, along road sides and on sporting ovals or fields. In spring your Kikuyu lawn (as with any lawn) should be mown very low and fertilised. This removes the thatch that has built up in your lawn and allows new stolon growth. An even surface of 75-100mm of a well drained sandy loam prepared before laying is important and fertilising of kikuyu is necessary to keep the lawn at optimum health. A summer fertilisation regimes should alternate between a chemical and organic fertiliser applied every 6 weeks at the equivalent rate of 10kg per 100m. In winter a single application of either a slow release fertiliser or organic type fertiliser will be adequate.